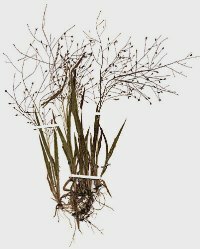 Panicum philadelphicum.Anna Gardner.Iowa State University.www.eeob.iastate.edu (Accessed 5/2014). Panicum philadelphicum is an annual C4 grass (Aliscioni et al. ), 10-50 cm tall, slender, branched from base. Leaves yellow-green, 0.3-0.8 cm wide. Sheaths and leaves often bristly-hairy. Flower spikelets 1-flowered, about 0.2 cm long, egg-shaped, mostly paired at ends of very thin stalks. Wetland status: FAC- (USDA, NRCS 2010). Habitat: Open, dry woods, fields, sandy or rocky soil.